A brand new design by Grand Seiko, high-end dials and a brand new, slim, hand-wound movement... A lot to love about the Grand Seiko Elegance Collection. Grand Seiko watches are undeniably great pieces. With a design all their own and an overall quality of execution that is unquestionable (for both the mechanics and the habillage), few of Seiko’s watches can be classified as elegant dress pieces with thin profiles. For Baselworld 2019, Grand Seiko embraces the path of thinness and refinement, with a brand new collection of four watches named the “Grand Seiko Elegance Collection”. A new design, the use of Urushi lacquer for the dials (a first for GS) and a new movement… Let’s take a closer look at the new references SBGK002, SBGK004, SBGK005 and SBGK006. From left to right: yellow gold SBGK006, rose gold SBGK002, rose gold SBGK004 and steel SBGK005. 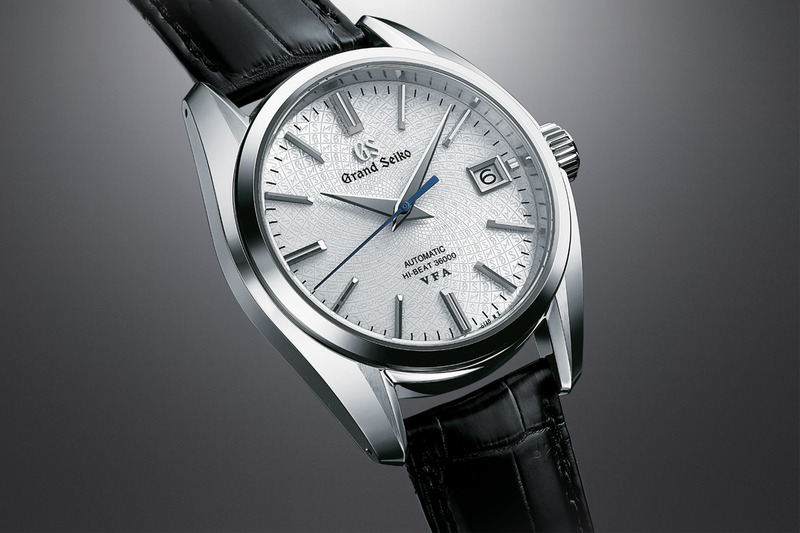 With its new “Elegance Collection”, Grand Seiko introduces an array of new features on its watches. In fact, everything is new here, starting with the case. Usually sharp and angular, Grand Seiko watches can sometimes lack a bit of refinement and often opt for a more casual, sportier attire. The new collection, as indicated by its name, is more focused on elegance and discretion. Without being totally different from other watches produced by the Japanese brand – we can find some shared elements, such as the facet on the internal side of the lugs – the case appears softer, more rounded, even though still quite “integrated”. There’s indeed no demarcation line between the casebands and the lugs (something typical of many GS watches). 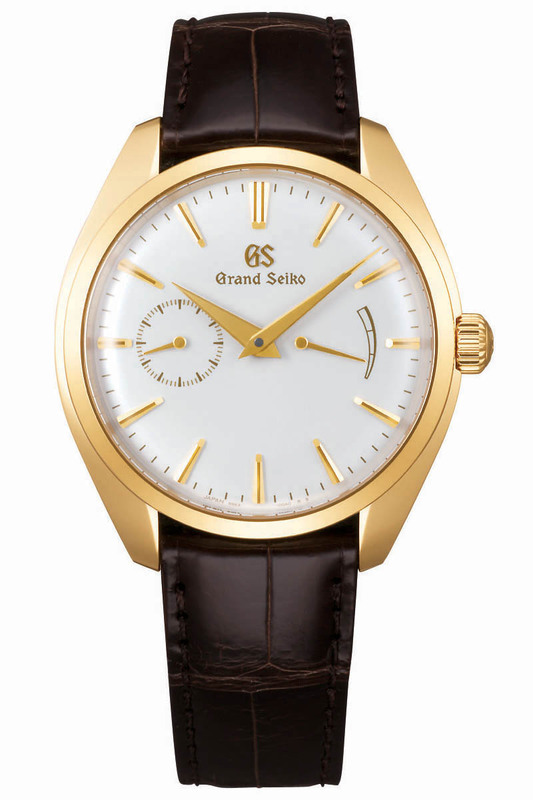 Still, the Grand Seiko Elegance Collection looks and feels… more elegant! In terms of proportions, the brand has opted for a relatively small diameter of 39mm – modern, suitable for most wrist sizes, and adapted to business attire. The brand advertises this new collection as “slim”. With a 11.6mm profile, it is indeed thinner than most watches of the brand, however, not a watch that befits the “ultra-thin” category either. The case is topped by a highly domed sapphire crystal and features a rather small crown. The cases are finished in the usual, beautiful Grand Seiko way, with polished and brushed surfaces. The mirror-finished parts are obtained by a special Zaratsu method created to accentuate the beauty of the curved surfaces. 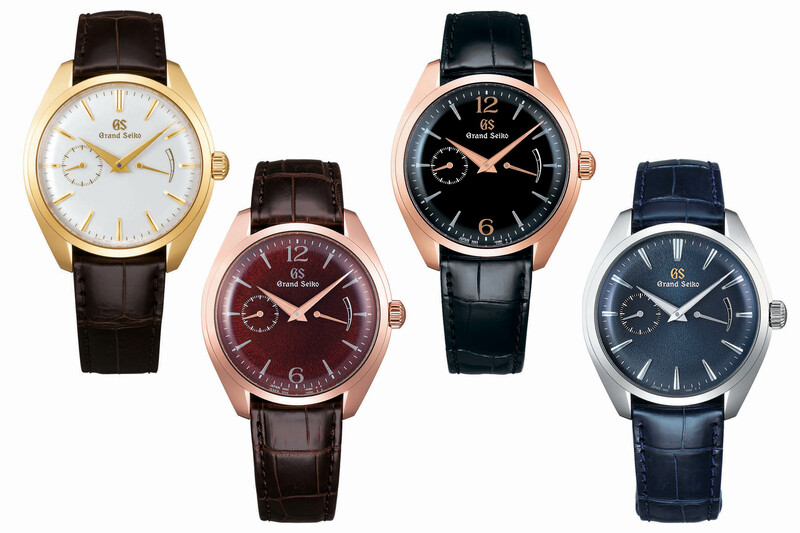 The collection comprises four models – 2 in rose gold (SBGK002, SBGK004), 1 in steel (SBGK005), with all 3 being limited in production and 1 non-limited model in yellow gold (SBGK006). All the watches are worn on crocodile straps, with pin buckles (gold models) or a deployment clasp (steel version). 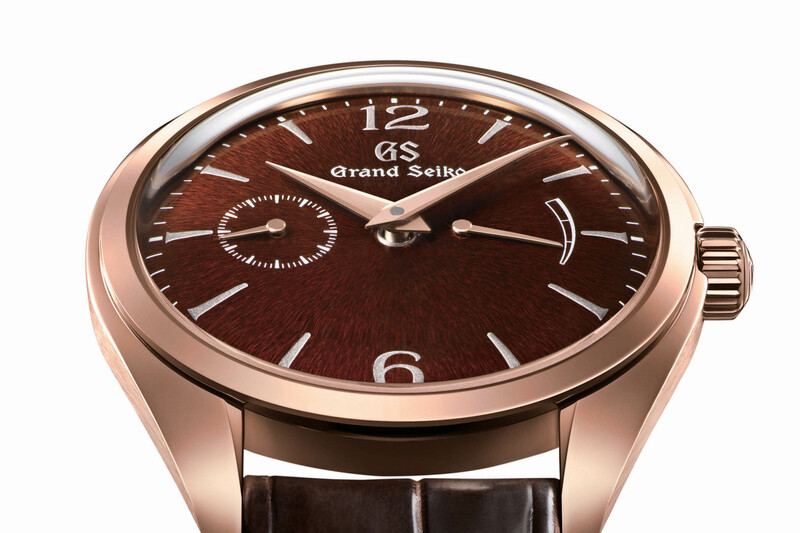 For the first time, Grand Seiko is using Urushi (Japanese lacquer) dials. 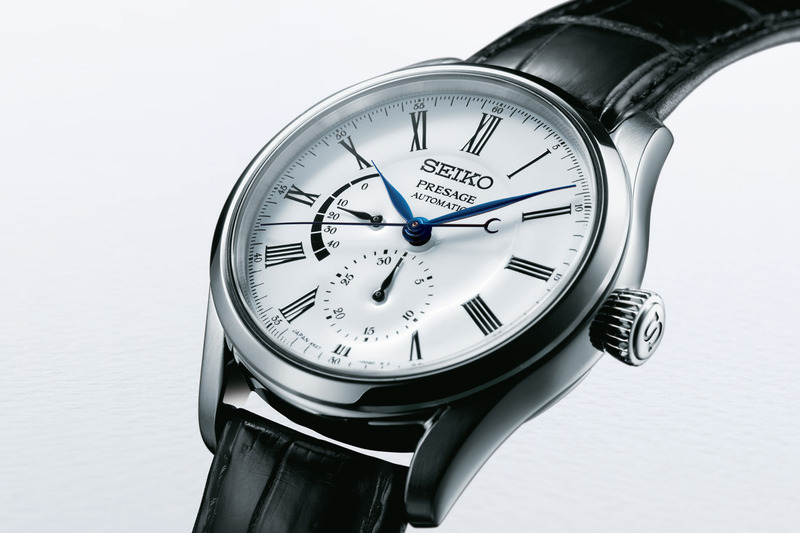 We’ve seen multiple Seiko Presage watches with such dials – here or here – but never in the higher-end collection. 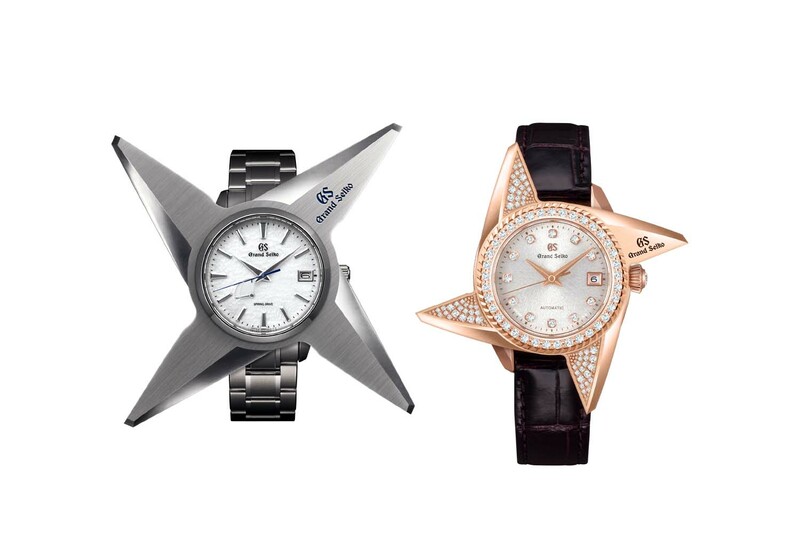 Note that the dials are domed on all models, adding to the elegance and slightly vintage feel of these watches. 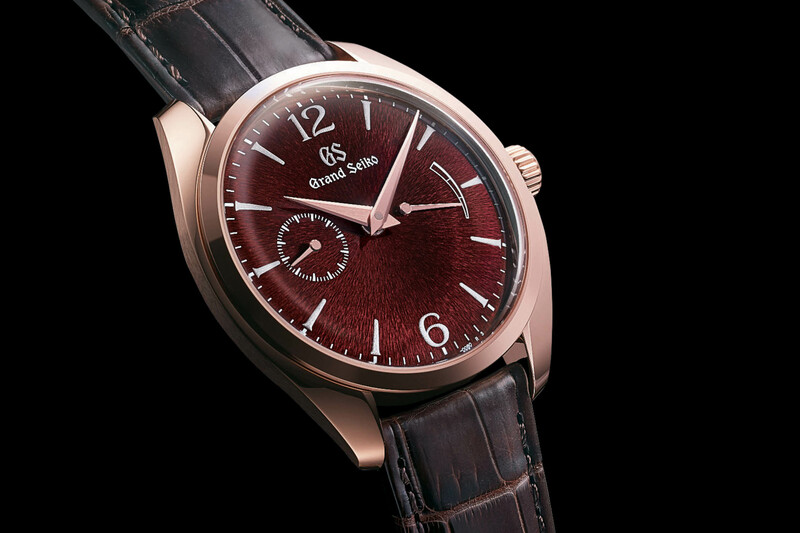 The SBGK002, with its texture amber dial, named “Suki-Urushi” lacquer. This special and superb technique of Urushi lacquer will only be available on the two rose gold, limited-edition models (SBGK002, SBGK004). 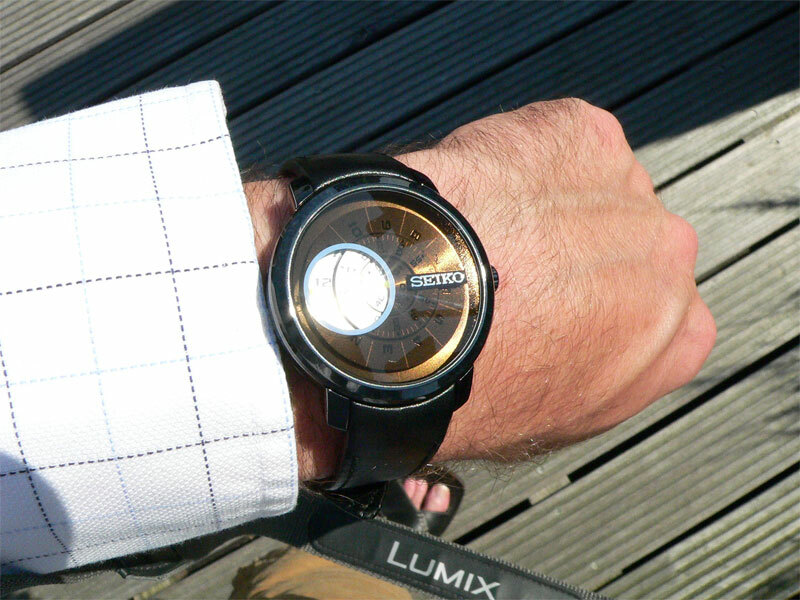 The first model, reference SBGK002, shows a textured amber-coloured dial. It is made from a transparent and long-lasting Urushi that comes from trees grown in and around the town of Joboji that lies under Mt. Iwate, the mountain that dominates the skyline above the Shizukuishi Watch Studio. Through the amber coloured “Suki-Urushi” lacquer can be seen the subtle Mt. Iwate pattern that reveals the watchmakers’ pride in the natural beauty that surrounds their home. 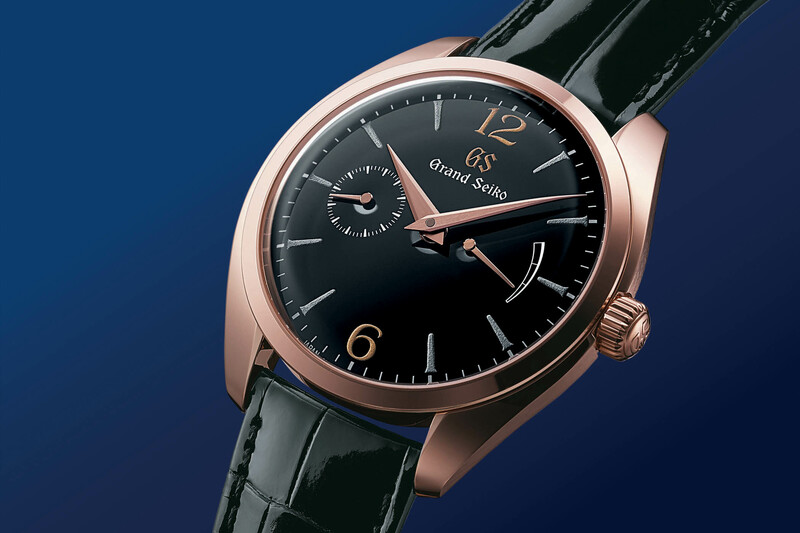 The SBGK004 has a rich black Urushi lacquered dial. 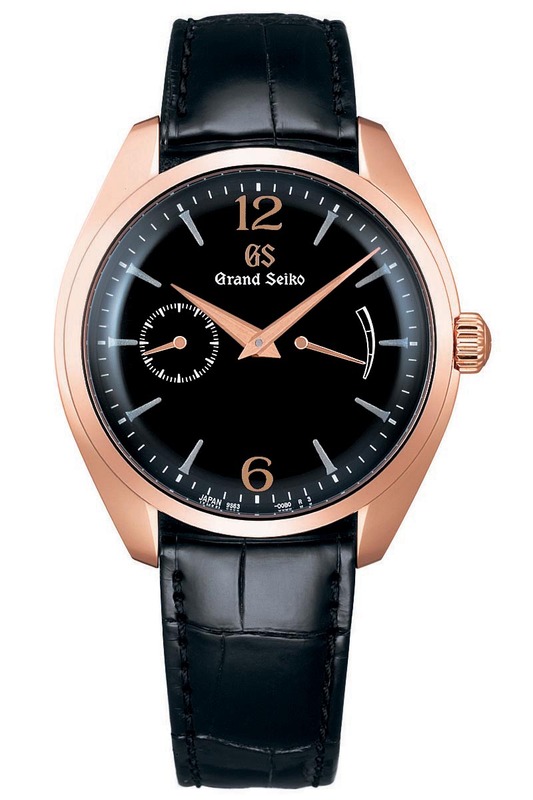 The other rose gold model, the reference SBGK004, also a limited edition, features a more classical – but still superb – black lacquer dial, still Urushi, which uses the same lacquer mixed with iron to give it its distinctive deep jet black colour. The colour is rich and the surface has a glossy sheen. On both creations, the hour markers and the “GS” letters are decorated with the traditional Maki-e technique by Urushi master Isshu Tamura in his studio in Kanazawa, on the west coast of Japan’s main island. Through the application of layer after layer of lacquer, these markers are given a three-dimensional profile and a delicate yet strong presence on the dial. Tamura then applies the powder, either 24k gold or platinum, and then polishes them by hand using his own special tools to give Maki-e its delicately shimmering appearance. 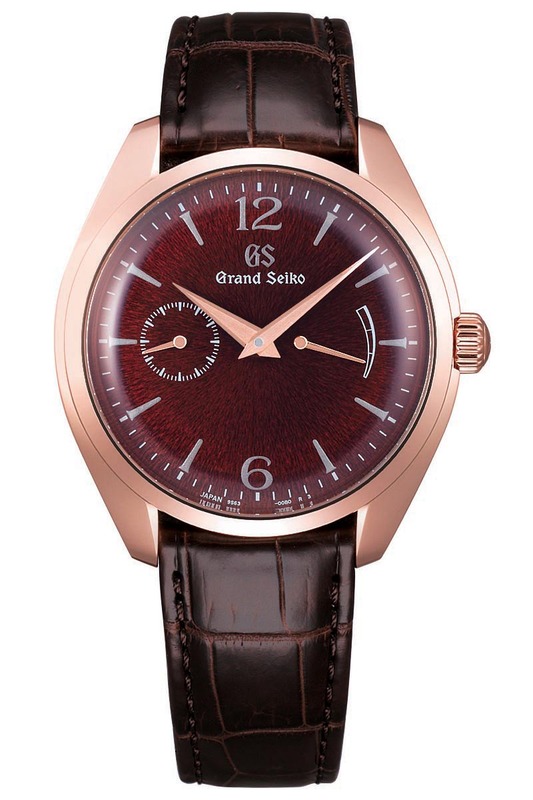 The steel version, reference SBGK005, depicts the same texture as the rose gold model, yet with a more classical painted dial, here presented in blue with applied indexes. The regular production model, in yellow gold ref. 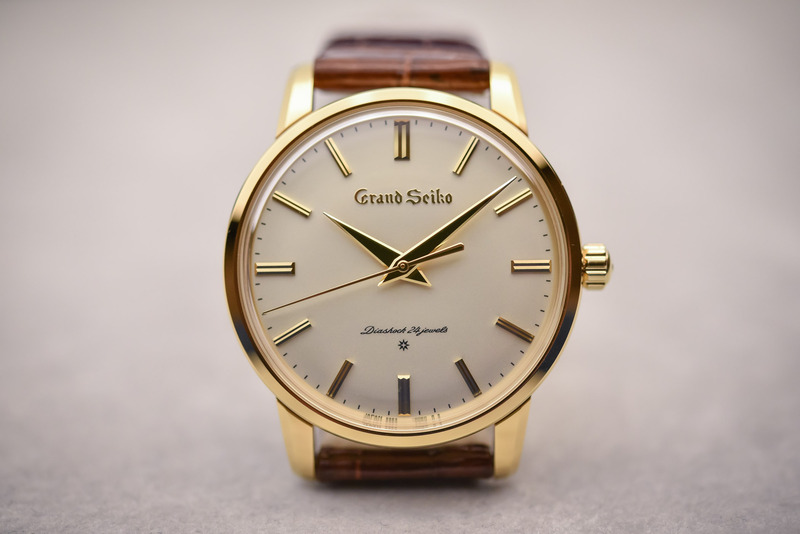 SBGK006, has a white opaline dial with applied indexes and hands in gold. Not only has Grand Seiko come up with a new design, but this “Elegance Collection” also features a new movement, calibre 9S63. While based on a known architecture – the 9Sxx that has celebrated its 20th-anniversary last year and that is the cornerstone of the brand – it introduces new complications. This hand-wound calibre 9S63 features hours and minutes in the centre but gets rid of the central seconds and instead displays it in a sub-dial at 9 o’clock and adds a power reserve indicator at 3 o’clock. 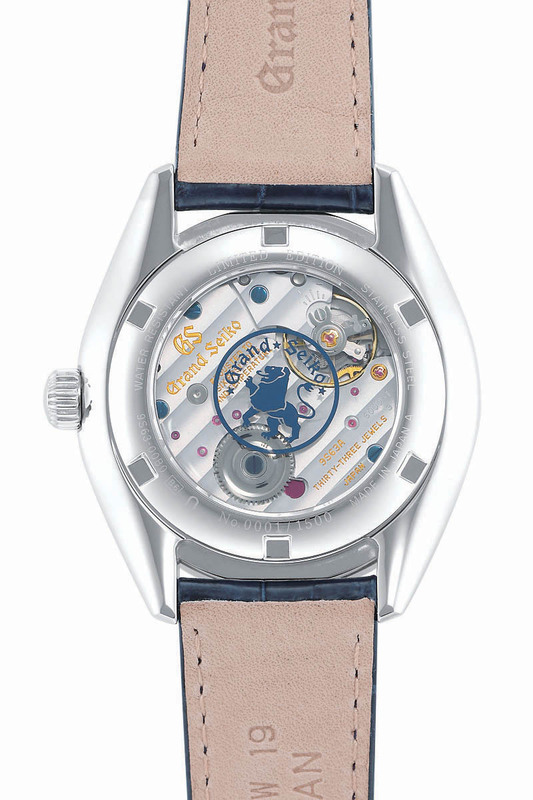 The movement is decorated in the typical GS style, with striping and polished chamfers. The steel model offers a slightly different decoration, with a blue lion mark and tempered screws. This movement beats at 4Hz and boasts 72 hours of power reserve. The three limited editions will be available as of March 2019 and the non-limited edition as of July 2019. This series will be available at Grand Seiko and Seiko Boutiques and selected retail partners worldwide. 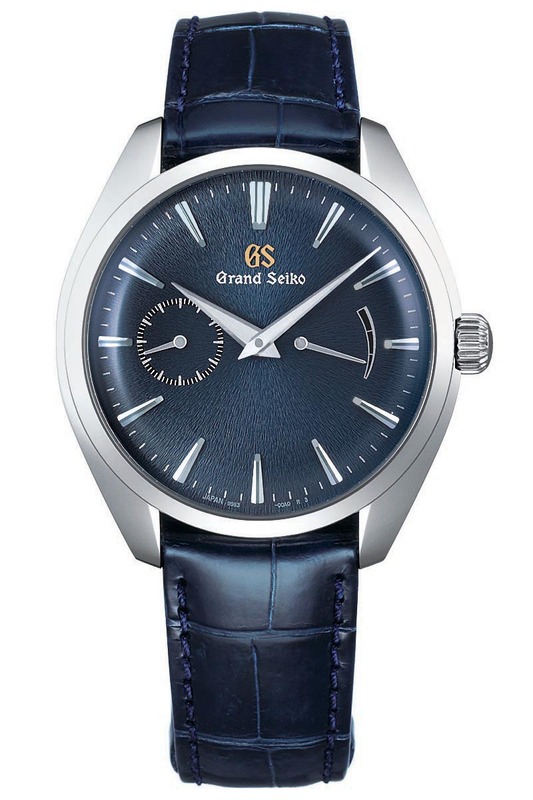 More details at www.grand-seiko.com. Beautiful watches but not really “slim”. Also, doesn’t make sense that one of the gold models is the non-limited piece. Finally, dial at 6:00 looks a little empty.